Situated in the heart of Saule Wood , in Saint Vallier, Auberge De La Saule offers a restaurant serving regional cuisine and a terrace area, ideal for the warmer months. Guestrooms at Auberge De La Saule come with a private bathroom. Modern facilities include a telephone, TV and access to free Wi-Fi. Guests can enjoy traditional meals with fine local wines at the restaurant and relax with a drink at the bar. Every morning a continental breakfast is served and guests can collect a packed lunch. Facilities at Auberge de la Saule include ironing, provision of newspapers and free private parking. 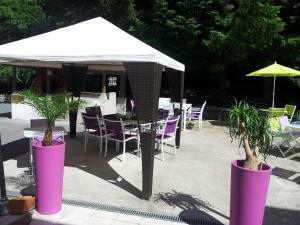 The hotel is situated in Burgundy, just 10 km from Montceau-les-Mines. Activities and sights nearby include cycling, hiling and visiting the vineyards.